I’m surrounded by caviar lovers, especially my mother who still talks about the tiny blue can I gave her as a present when I was still a child. I knew how much she loved it and I felt so proud and grown up when I bought it for her! The prices for this delicacy were much lower than they are now, unfortunately, those days are over. No black eggs as presents anymore! Personally, I’m not crazy about it, I like and appreciate its fresh sea taste but the (much cheaper) red trout caviar is also fine for me. However I’ve been wanting to cook with it for quite a while and the time has come. 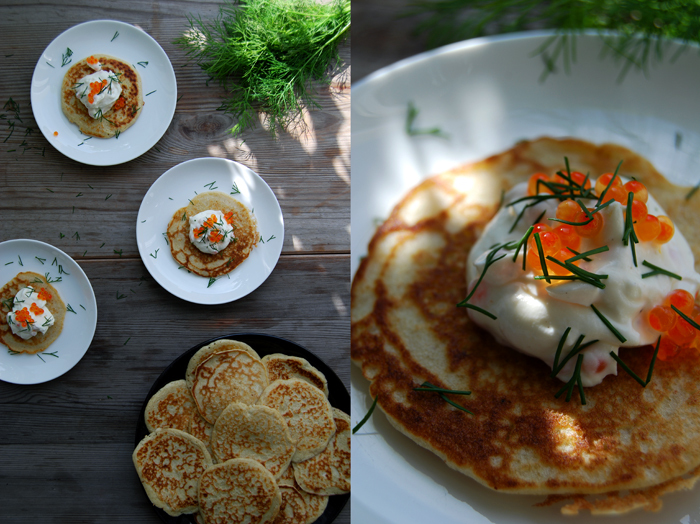 I decided to go for the classic combination of buckweat blinis, roe cream and dill. 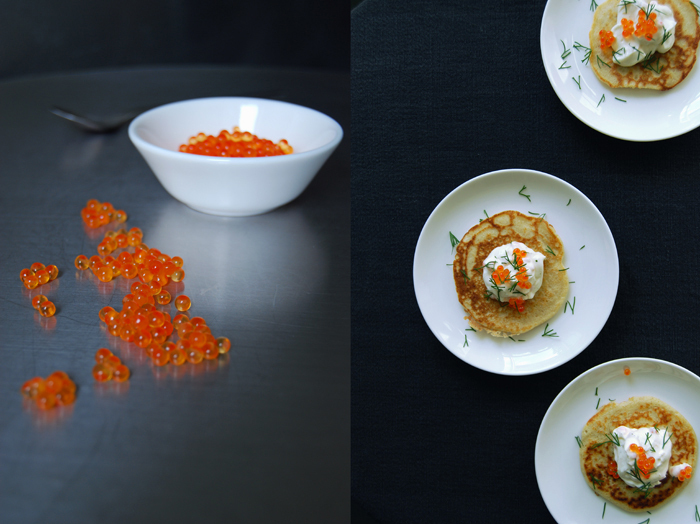 It’s perfect for a summer brunch or as a starter for a dinner party, a small sumptuous treat! The dip is also great on dark rye bread! Combine the flour, buckwheat, salt, sugar and yeast. Add the milk, egg yolks, sour cream and butter and mix until well combined. Let the dough rise in a 35°C / 95°F warm ( top / bottom heat, no fan!) oven for 45 minutes. Beat the egg whites with a pinch of salt till stiff and fold into the dough before you cook it. Heat a non-stick pan on a high-medium temperature and coat with a thin layer of oil. 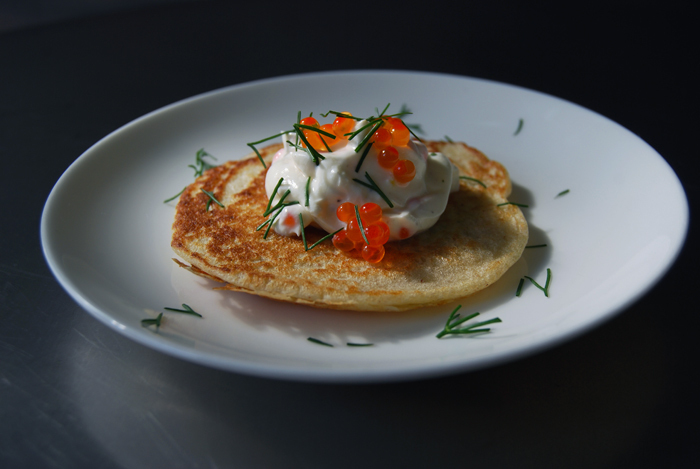 Pour in 2 tablespoons of batter for each blini and cook for around 1 minute on each side or until golden brown. 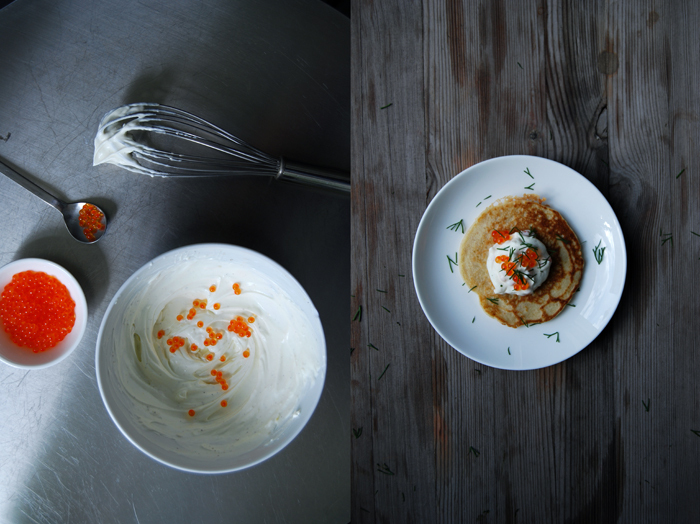 Whisk the cream cheese, sour cream, lemon zest and juice and season with salt (carefully, the roe will add some saltiness) and pepper to taste. 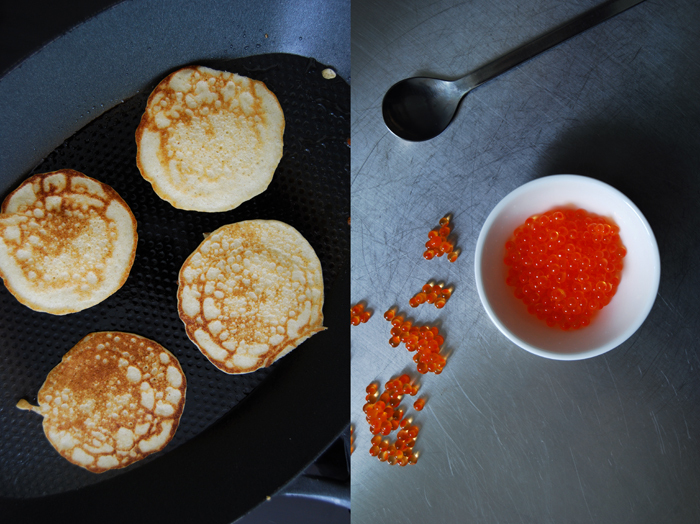 Gently fold in the roe, leave a few to garnish the blinis. 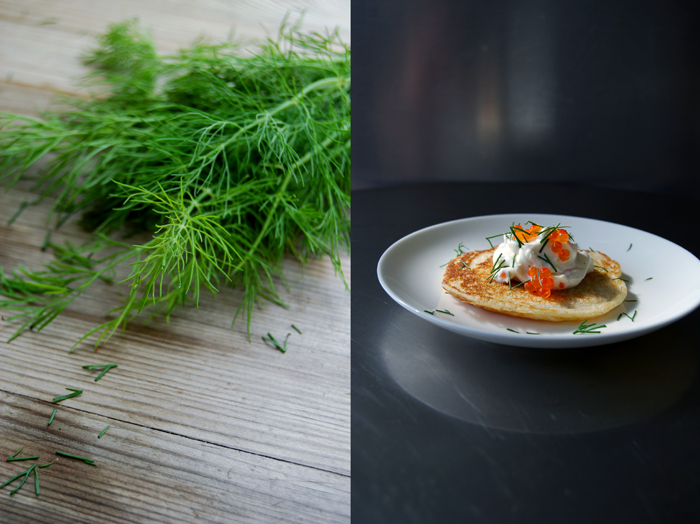 Dollop a spoonful of the dip on each blini and top with some roe and dill.